Unsolved problems with the Navantia-built HMAS Canberra and HMAS Adelaide warships could impact on the Spanish company’s bid for the Future Frigate Program. The Spanish shipbuilding firm is one of three tenderers hoping to secure the SEA 5000 contract, which is part of the $89 billion national shipbuilding endeavour. The Future Frigates, which will replace the eight-strong Anzac Class frigate fleet, are the next generation of naval surface combatants and will conduct more challenging maritime warfare operations in the Australian region, including delivering a greater impact on anti-submarine operations. The nine frigates will also be equipped with a range of offensive and self-protection systems. But the ongoing investigation and maintenance work on the two amphibious assault ships may hinder the Spanish shipbuilder's bid against its fierce competitors, BAE Systems and Fincantieri. The two Navy ships, which each cost $1.5 billion, have remained tied at Garden Island, NSW, for over a month after propulsion issues were discovered with HMAS Canberra while it was undertaking first of class flight trials with Army and Navy helicopters off the coast of Queensland. In a statement to Defence Connect, the Department of Defence said it is unable to comment on any bids from the tenderers at this stage. Defence Minister Marise Payne, Defence Industry Minister Christopher Pyne and Deputy Chief of Navy, Rear Admiral Mike Noonan have all denied various reports of alleged oil problems due to mismanagement. RADM Mike Noonan released a statement in response to "misleading" reports about the issue. 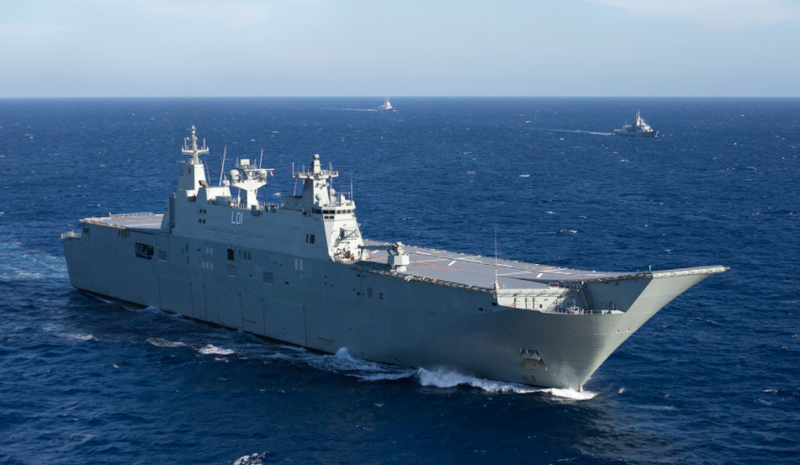 "Defence has maintained and operated HMAS Ships Canberra and Adelaide in accordance with the builders' specifications, including the oils and lubricants used in their operation," the statement read. "Defence’s leadership is not 'baffled' by these emergent issues, but it is still too early to determine the full extent of this emergent work. Defence has, and continues to work closely with industry and the original equipment manufacturers, Navantia, Siemens and BAE, to identify the root cause of the issues and develop the most appropriate repair strategy. Minister Pyne said: "One of them [the landing helicopter dock] was discovered to have a propulsion problem when it was out on manoeuvres and to check whether the other one had the same issues. That was looked at, it was found to have the same issues so both are being fixed in routine maintenance programs as is normally the case. It certainly had nothing to do with oil, I don’t know where that story came from." The minister also played down the issue with the warships, saying it is not a serious problem, but he was unable to confirm when the problem is expected to be solved.